My name is Cheryl Andrews and this is Axle, my 2 year old GSD. We are with a K9 Search and Rescue Team in Maryland and this picture was taken at my house in our back yard on our trampoline. I use the trampoline to help with agility training.....He loves to jump up on it. Our team and K9's are trained to go and search for lost, or missing people and at times human remains. My goal is to cross train Axle on air scent or also known as live and also HRD or human remains. Thanks so much for sharing the story of your handsome German Shepherd Axle. What a gorgeous boy he is. Way to go on putting him in the training classes too - that is fantastic. 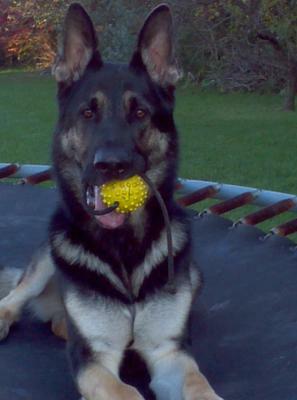 German Shepherds are so smart and they just blossom with the right training and reinforcement! If you happen to have any pictures of him "on the job" please share them with us too because I'm sure I'm not the only one who would love to see them. Not everyone is sure what is involved in Search and Rescue anyway so that could be very educational for a lot of people! And really interesting too. Thanks again and continued success with Axel! I am convinced he will do well.